So, my Jewish readers who are feverishly starting to prepare definitely know why this is coming. I personally love to have my food ready in advance, in the freezer. 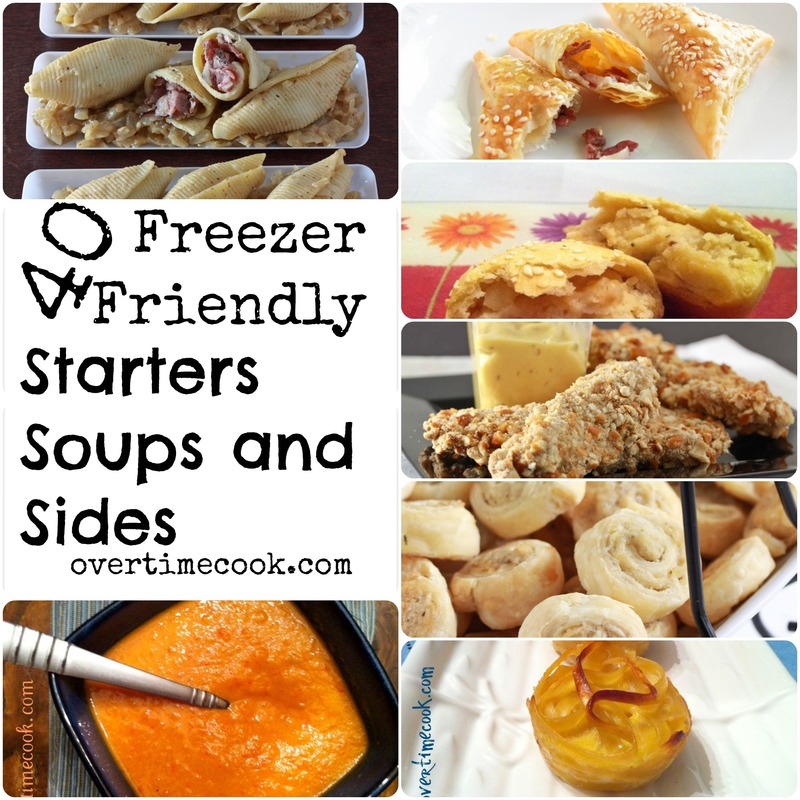 Most of the cakes and cookies on the blog freeze really well, but I figured I would help you out with some recipe ideas for starters, sides and soups…that all freezer well! Scroll down for 40 suggestions. Some from me, some from my blog friends, and some that I found on the internet. Based on personal experience, recommendations from the blogger, or my general knowledge of cooking, the recipes below should freeze nicely, freeing you up to relax on the holidays! Note: Recipes that are on other blogs are not by me, and have not been tested by me. They simply look and sound good to me! Thanks for including me in this! You’re right, this is a great resource for all year long. When my freezer empties out after the chagim, I’ll definitely be coming back here for ideas. Thanks for including my rice recipe! This is going to be a huge help! Thanks and ktiva v’chatima tova! This is wonderful! I cook for just two of us so the freezer is my best friend and I’m always looking for tips on what foods store well. Thanks for the post — I’m definitely bookmarking this one. Thank u!! Just what I needed ! Thanks for including mine! I can’t wait to try a few of these. Happy New Year! I will certainly need to look into these alternatives! I’m not much of a canner, but I do cook and freeze in indivual portions a lot. What a great way of sharing the other bloggers’ ideas! Thanks for including my cauliflower cutlets! What a great roundup of recipes here! I found lots of inspiration here! Starting off with the onion-mushroom mini quiches and will move on from there! Thanks! The vegetable croissants are amazing, thanks for sharing! I’ve got lots of yummy vegetable sides but none of them would freeze well. Check my recipe index for the links! Do you find these recipes taste better uncooked and frozen or cooked and then frozen? Do u think i can use corned beef cuts for the turnovers? shoulf i freeze tbem raw or baked? You can try corned beef, but the flavor will be different. Before baking is better, but it’s fine to freeze them already baked too. thanks for including me in your roundup! i love the lists you compile. so many of these look recipes look absolutely awesome! i’m a busy dude, so anything i can do to cut some time off of my cooking every night is a huge help (especially when i have one of those days at work…). my go-to is russian-style ravioli (aka pelmeni/peroshki). i tend to sit down on a sunday, make a couple hundred, and freeze them. pop a few in boiling water whenever i’m hungry and i can eat in 5 or so minutes. keep up the great work, i’ll be sure to stop in now and again!